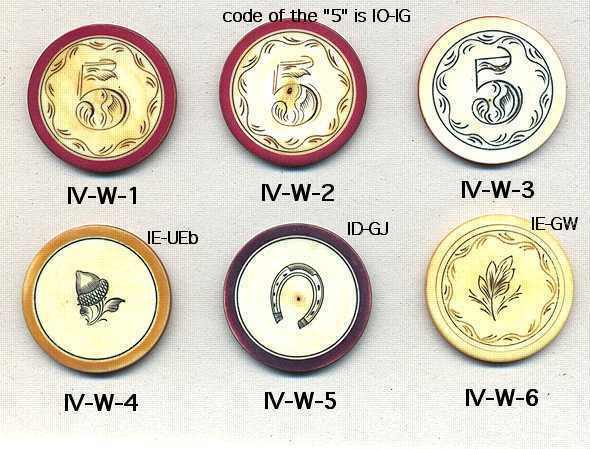 These standard-size ivory poker chips (1-1/2" diameter) are all new codes. (The codes are noted above in the picture.) All were found together -- 80 chips in all (15 fives, 45 leafs, 10 acorns and 10 horseshoes). Many of the fives (not included here) were damaged. All of the chips presented for sale here are in good shape -- no cracks, etc, unless noted here. Particularly nice is the rare 7-bump line surrounding the "5" and the leaf. I see this line on only one other 5 and no other leafs. If you want any of these, let me know before you send money (limited quantities), and add $3.00 to the order for postage-insurance. Return privileges as always.